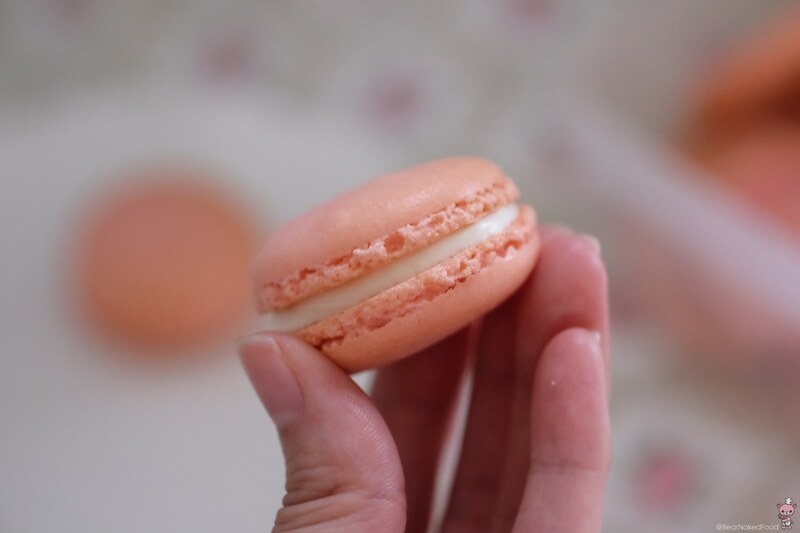 Since I’ve “unlocked” the “secrets” to making perfect macarons, I’ve been trying out different flavors and I can’t help but to fall in love with this oh-so-pretty Rose Water Macaron. 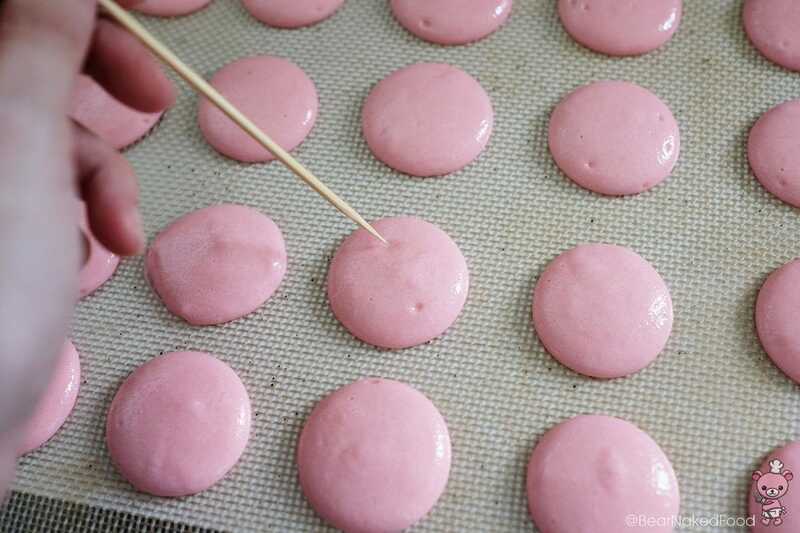 If you have read my previous post on 11 Essential Rules to Making Perfect Macarons, you’ll know some of the secret steps are aging of the egg whites and the addition of tapioca starch. 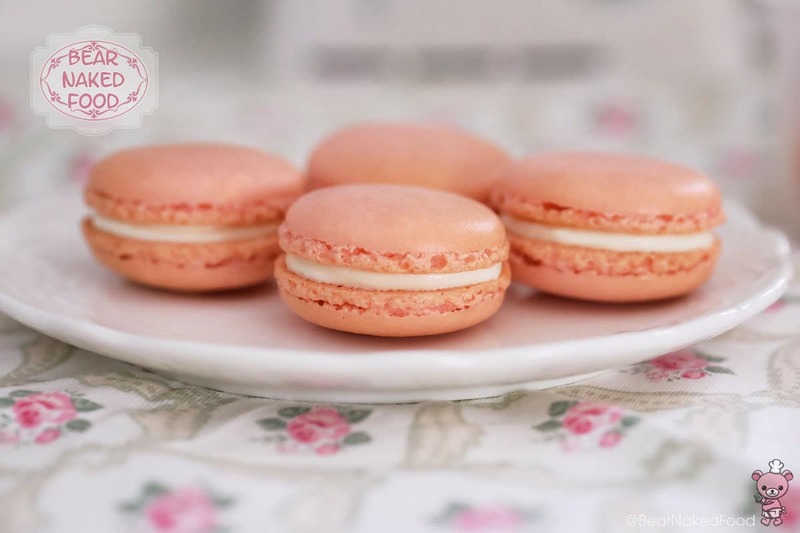 For today’s Rose Water Macaron, I actually omitted the tapioca starch in the meringue and you know what, they still turned out well! 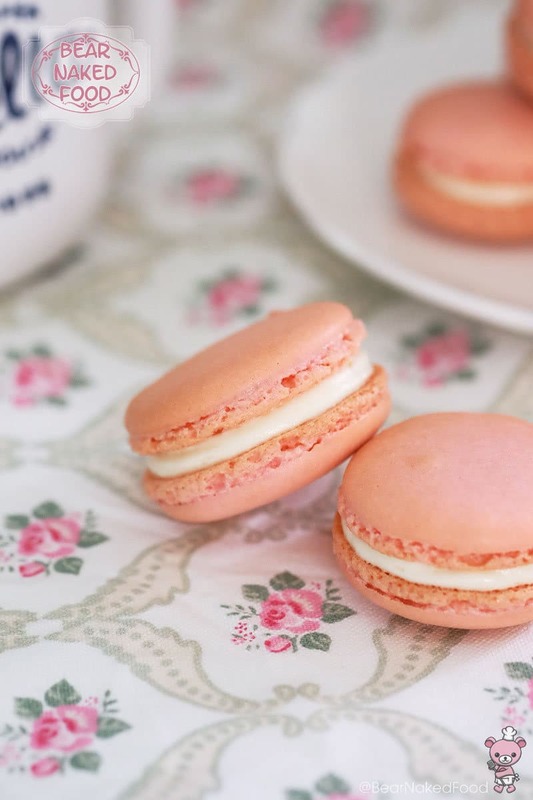 So if you are confident in macaron making, you could totally do without it but I would still highly recommend it for novice macaron bakers. The line up for rose water buttercream. 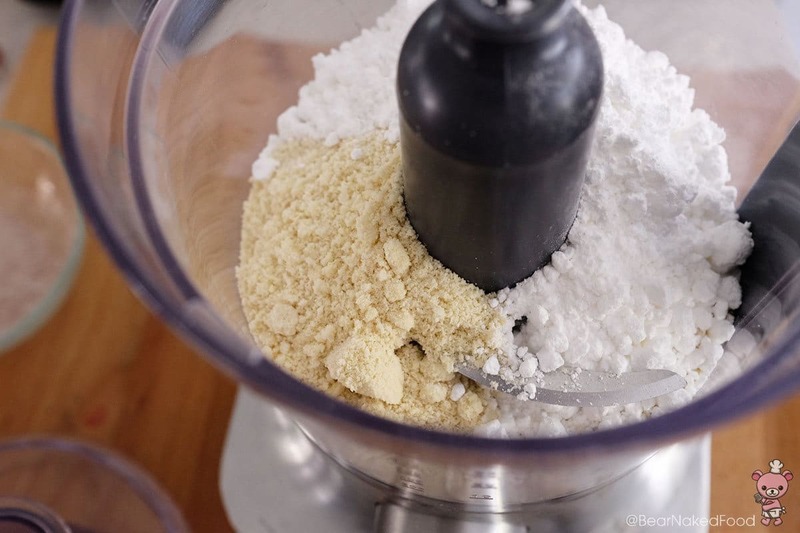 In a food processor, add in icing sugar, ground almond powder and pulse for 30 secs into fine powder. 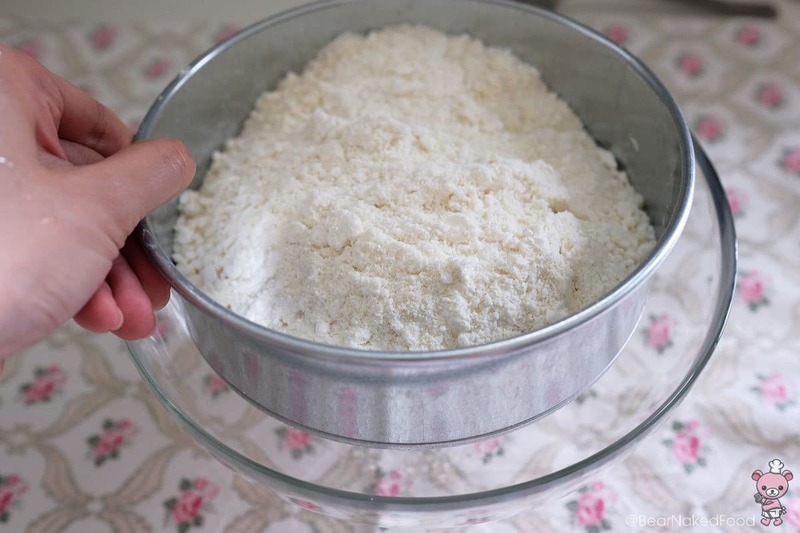 Put the mixture through a sieve and remove any big lumps. 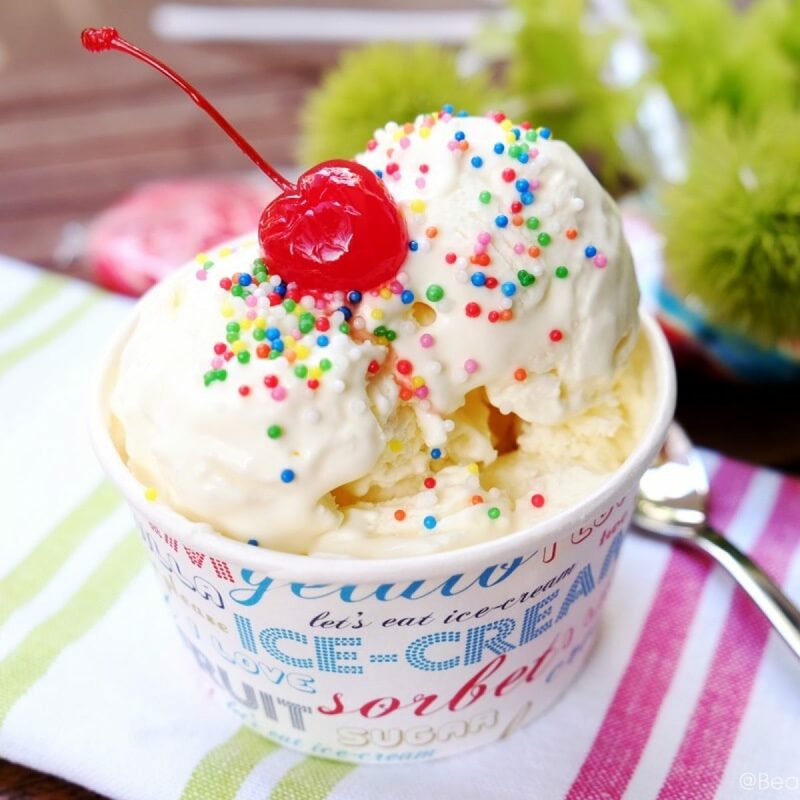 Transfer to a mixing bowl and set aside. 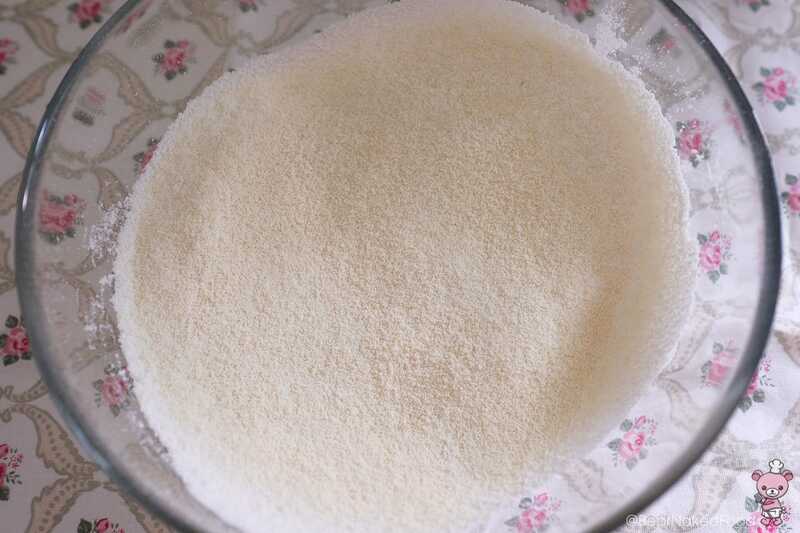 In another small bowl, add the tapioca starch and sugar together and mix well. 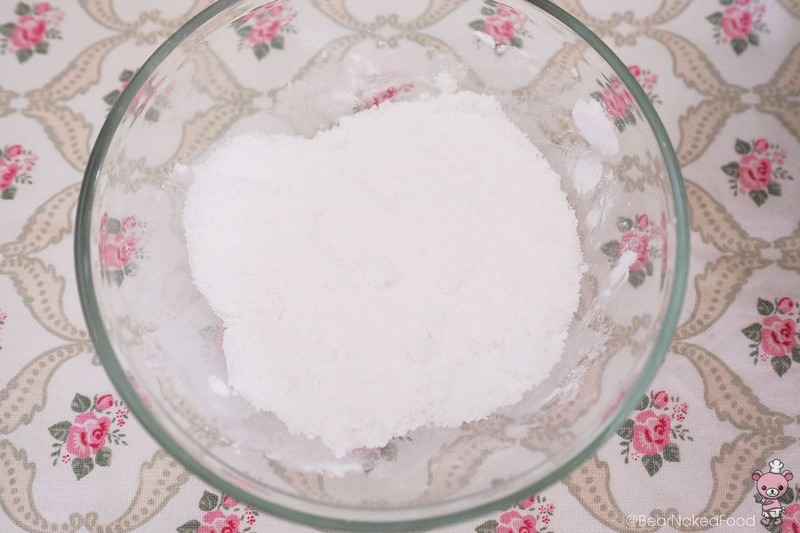 In a mixing bowl, add in egg whites, cream of tartar. 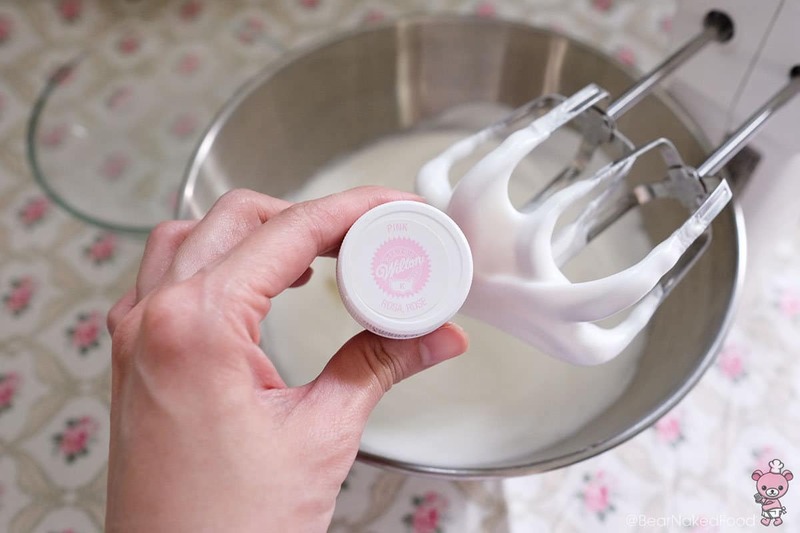 Using an electric hand mixer or stand mixer, whisk until foamy. 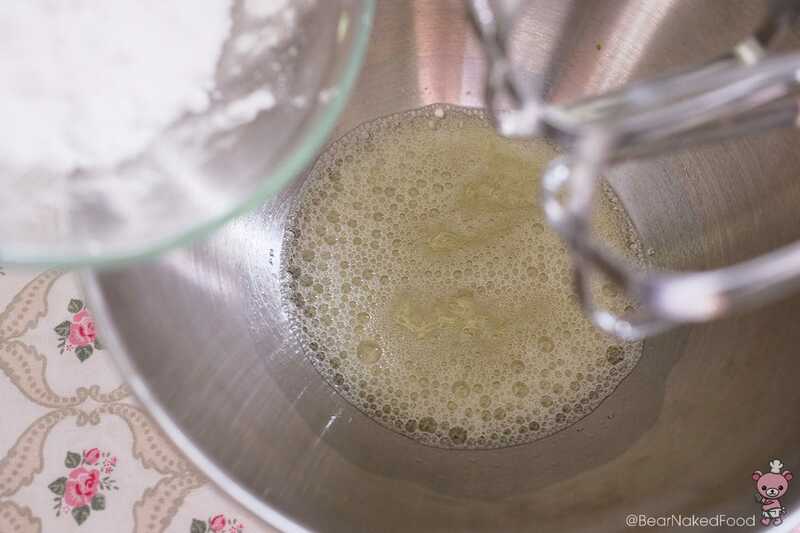 With the mixer on low speed, add in the sugar slowly and whisk until soft peaks. 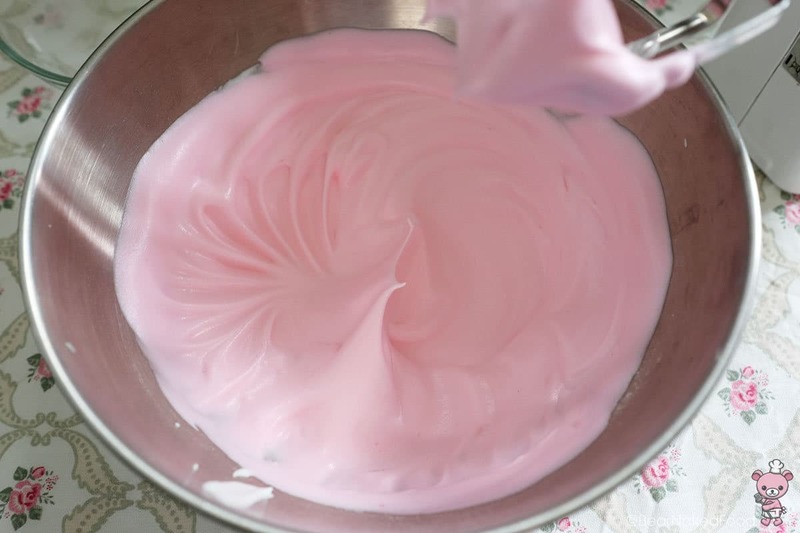 Drizzle in rose water essence and turn up the mixer to medium speed. 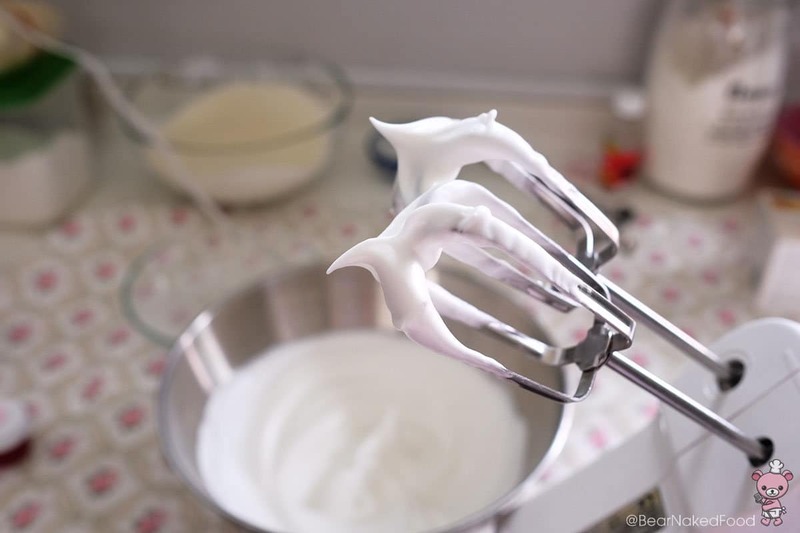 Continue to whisk the meringue until stiff peaks. 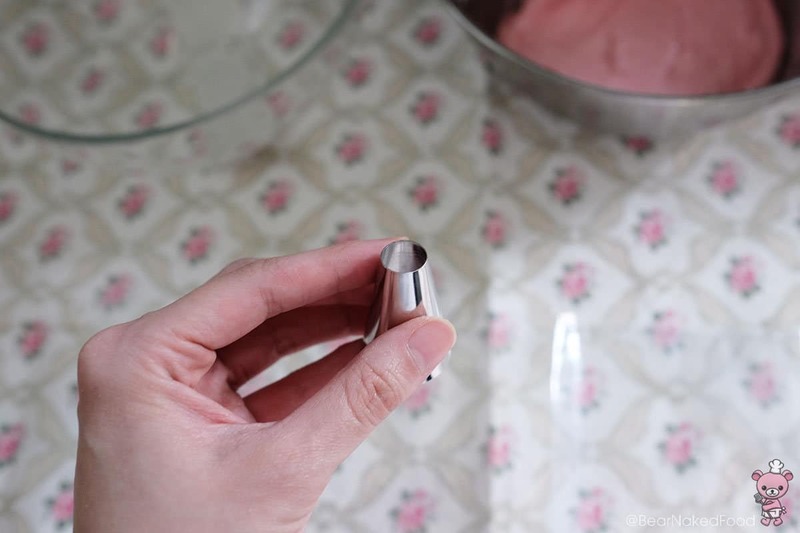 Add in pink color gel by using a stick or skewer. 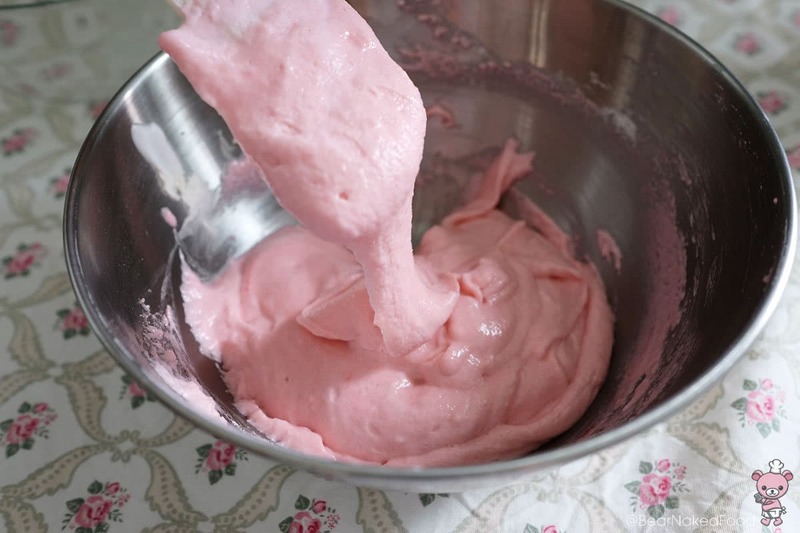 I’m using Wilton Pink Rose gel. Turn on the mixer and mix until the color is well combined. 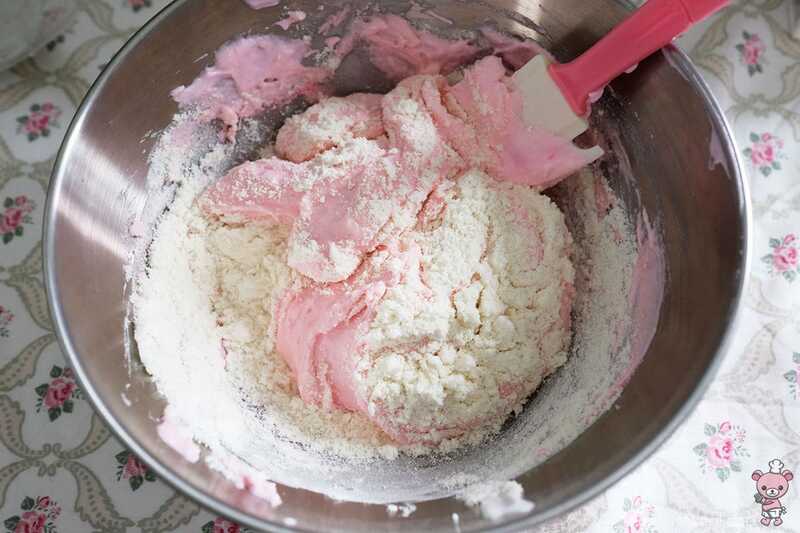 In 3 batches, fold the meringue with a spatula into the icing sugar and almond powder. It should resemble a lava-like texture. 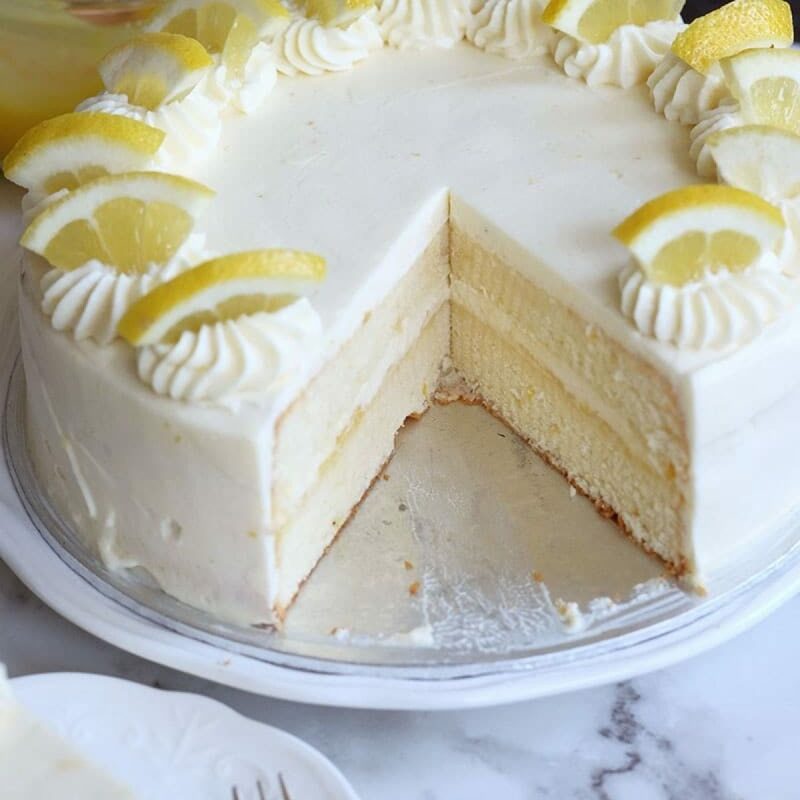 When you raise the spatula, the batter should flow down slowly and perfectly okay if it breaks in between. 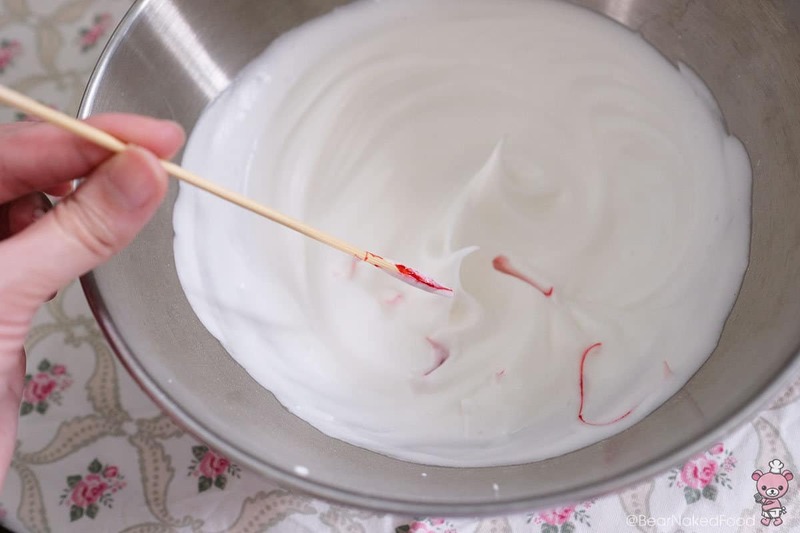 Fill the meringue into a piping bag fitted with a round tip nozzle. I’m using a Wilton 2A round tip. 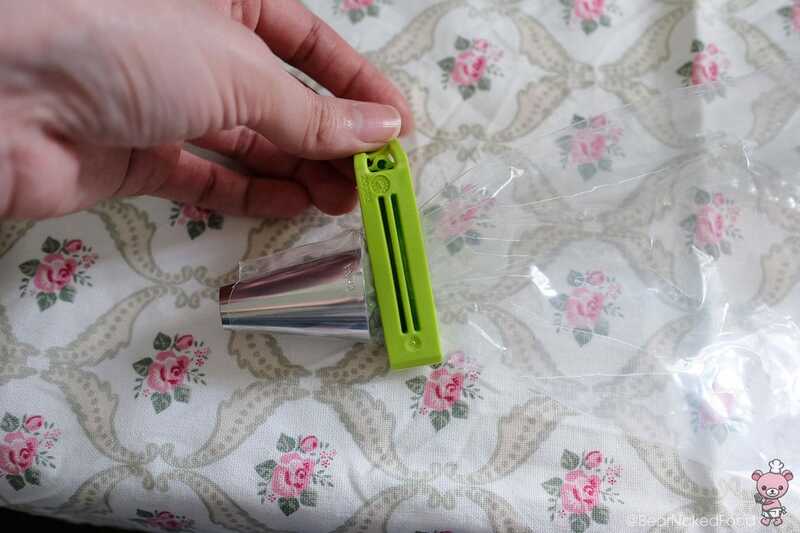 Secure the tip of the piping bag with a clip. This will prevent the meringue from flowing out. Place into a tall glass. 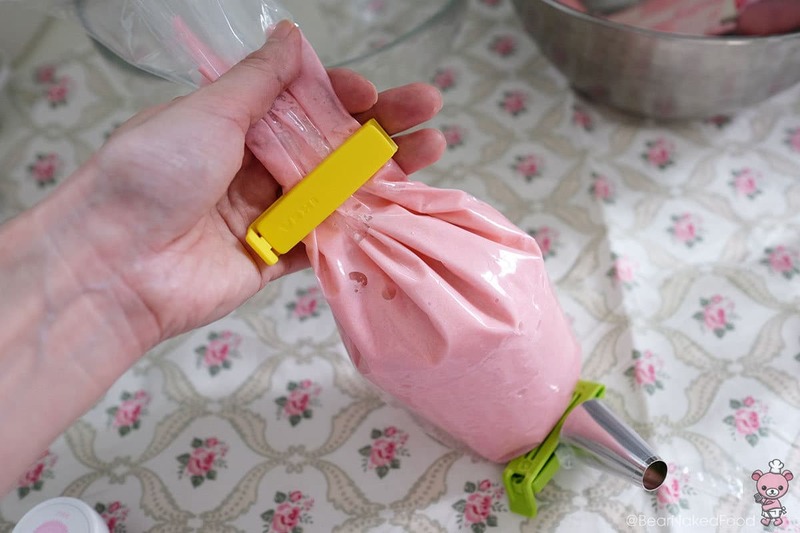 Secure the opening of the piping bag with another clip to prevent the meringue from escaping. Remove the bottom clip when you are ready to pipe. 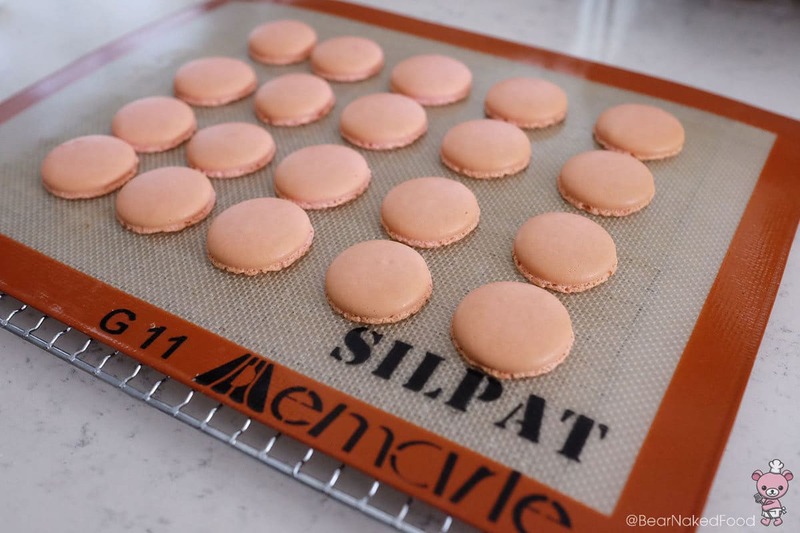 Pipe the meringue onto a silpat or baking tray lined with non-stick baking sheet. 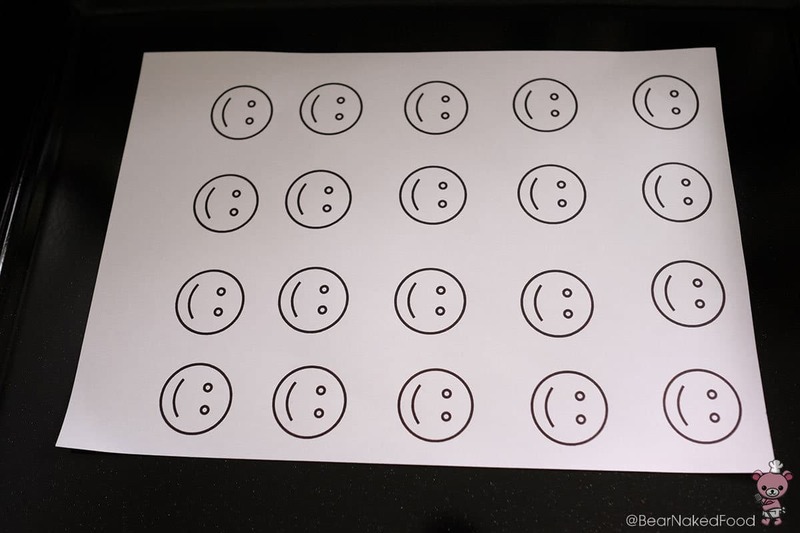 I placed a template in between the tray and baking sheet to guide me on the piping process. 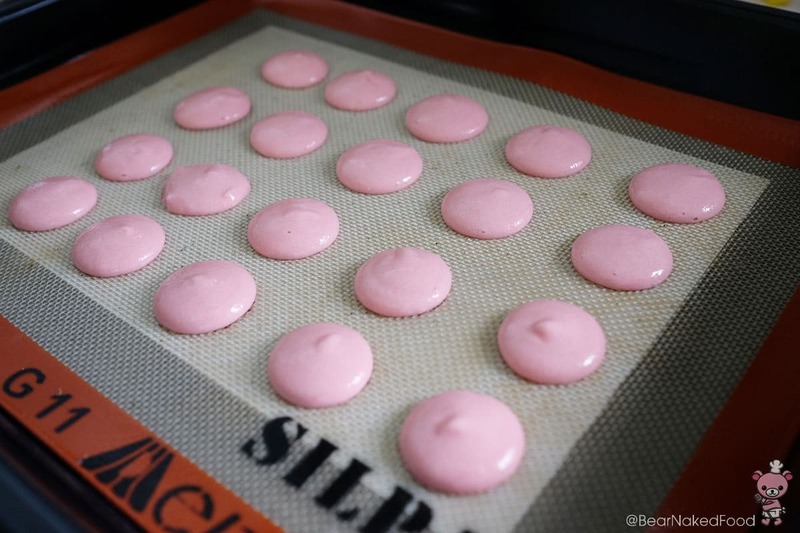 If using baking paper, squeeze a small dollop of the meringue at the 4 corners of the tray to secure the baking sheet to the tray. Remove the template once you are done. Rap the tray a few times on the counter to remove air bubbles. 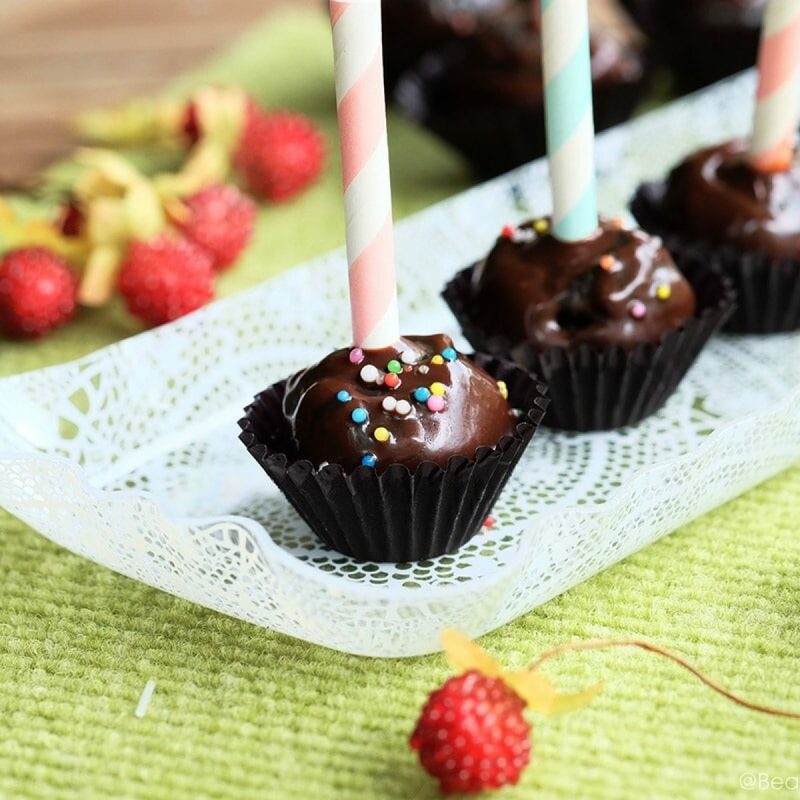 Use a skewer to break up large air bubbles. 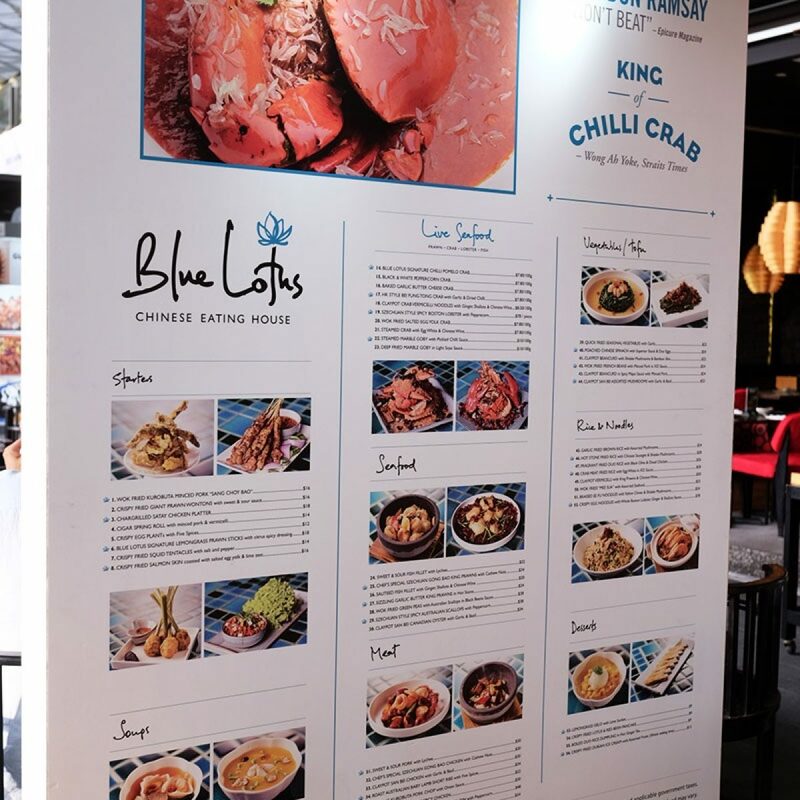 Set it to dry at room temperature for 45 – 60 mins or in an oven preheated at 40°C for 15 mins. 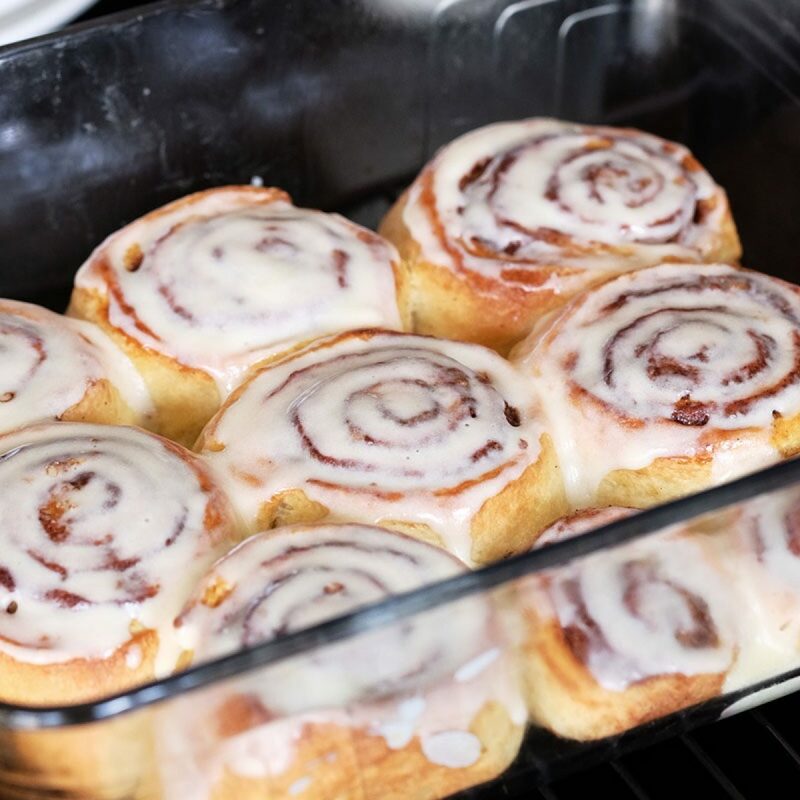 Set in the oven to dry. 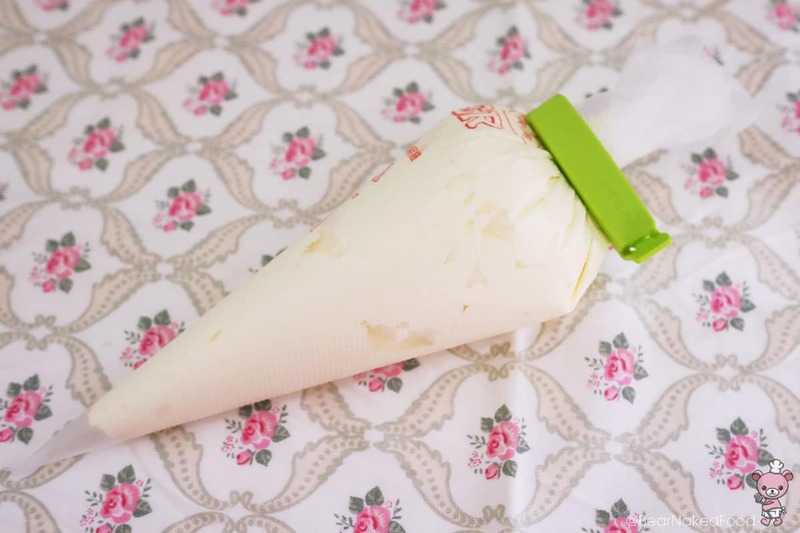 Alternatively, dry under a fan for 30 – 45 mins. 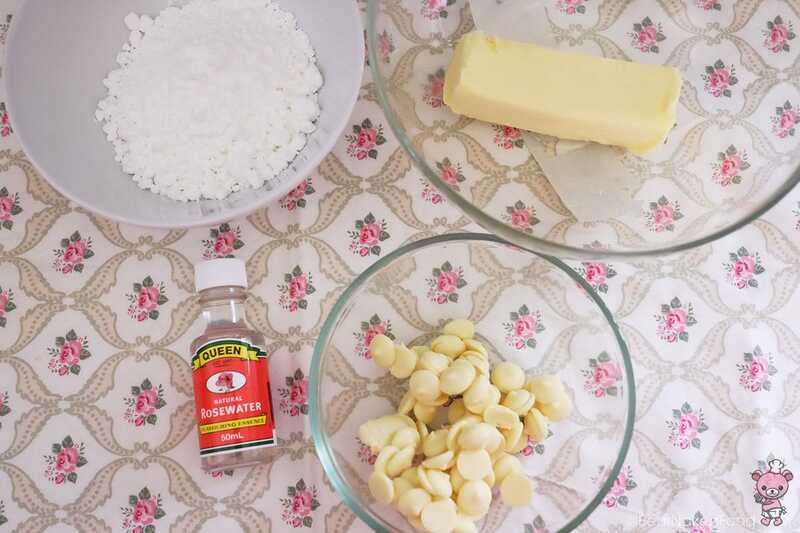 While waiting, prepare the buttercream filling by creaming the butter and icing sugar together till light and fluffy. Add in melted chocolate and rose water essence. 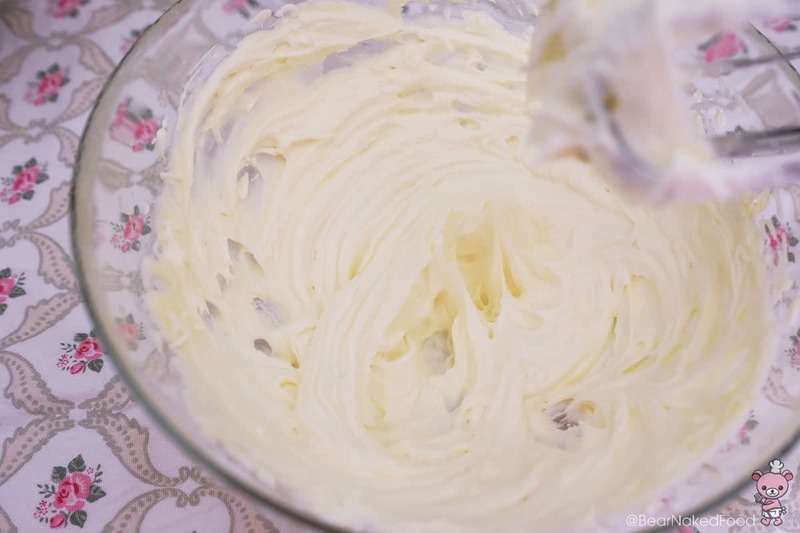 Continue to whisk for another 1 min. 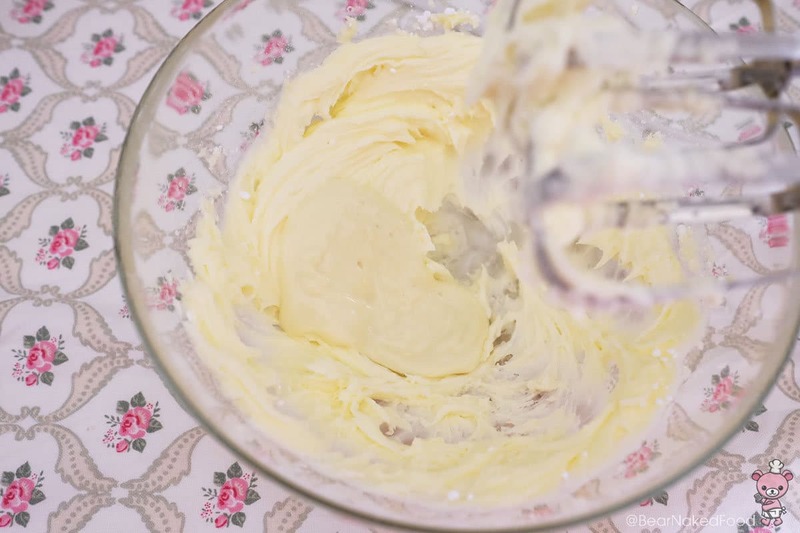 Fill the buttercream in a piping bag. 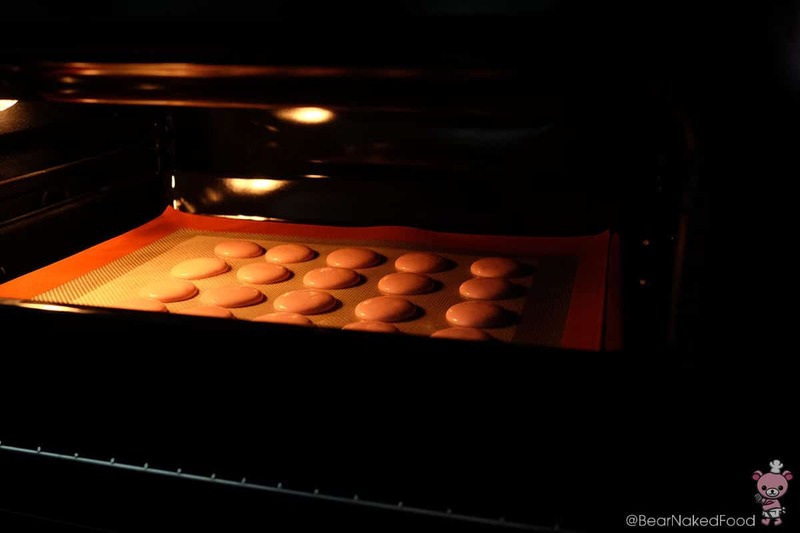 Do not cut off the tip of the bag until you are ready to fill the macaron shells. Check the meringue by gently touching the skin of the meringue. It should be dry to the touch. 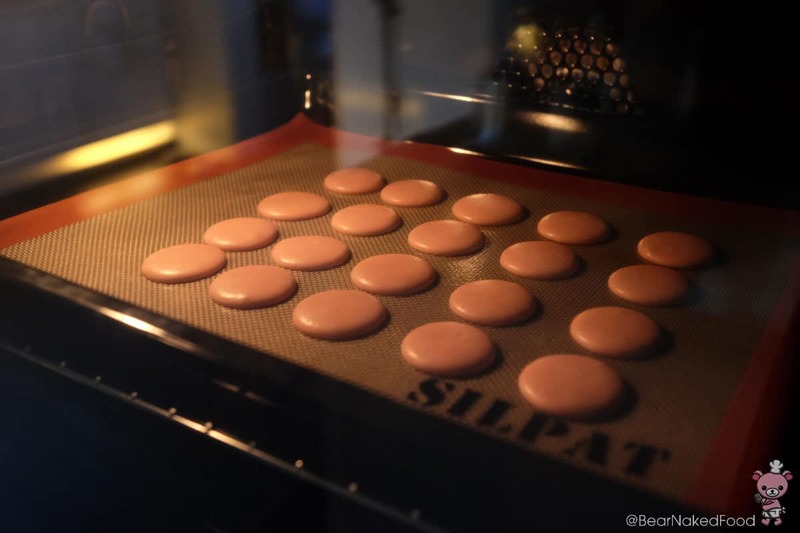 When the meringue is ready, bake in a pre-heated oven at 150°C for 15 mins. Cool them on a wire rack completely before piping the buttercream filling. 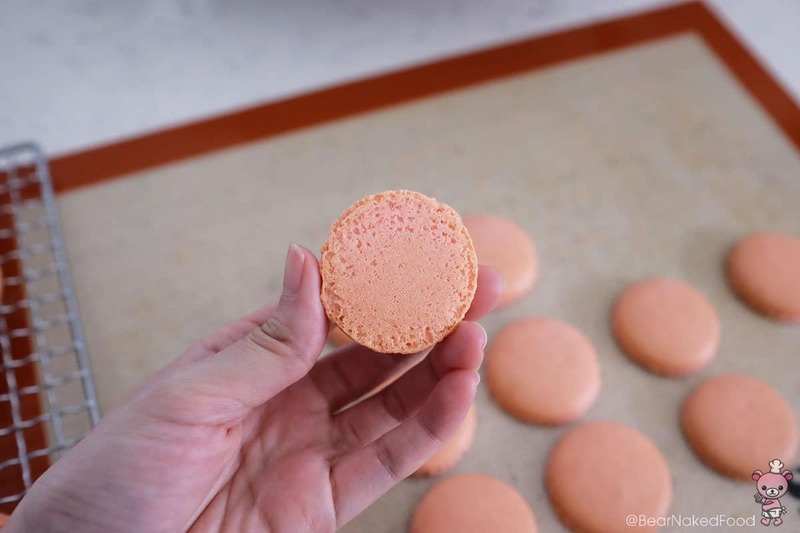 You should be able to peel off the macaron shells easily. 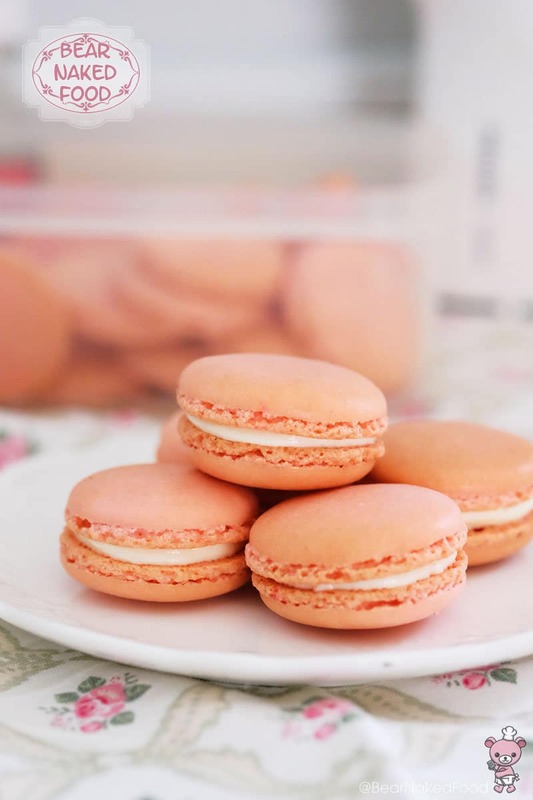 If making ahead, store the cooled macaron shells in an air-tight container. 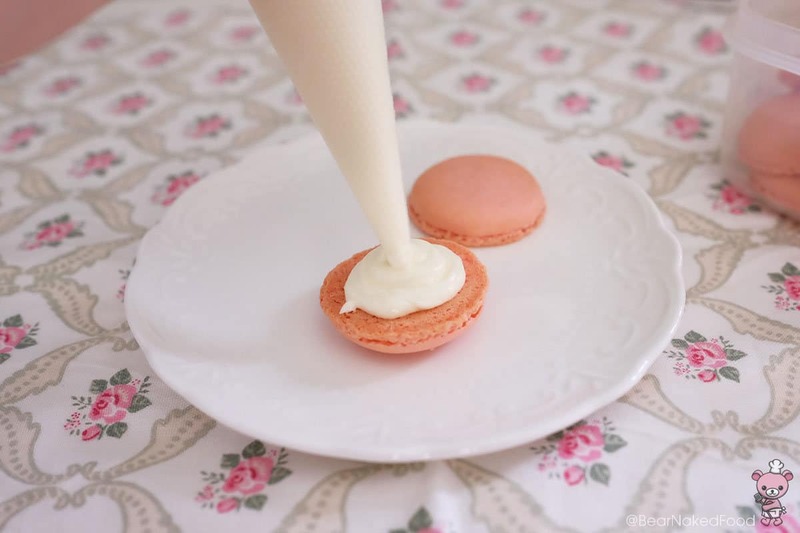 Pipe the buttercream on the centre of the macaron shell and cover with another. Repeat with the rest. 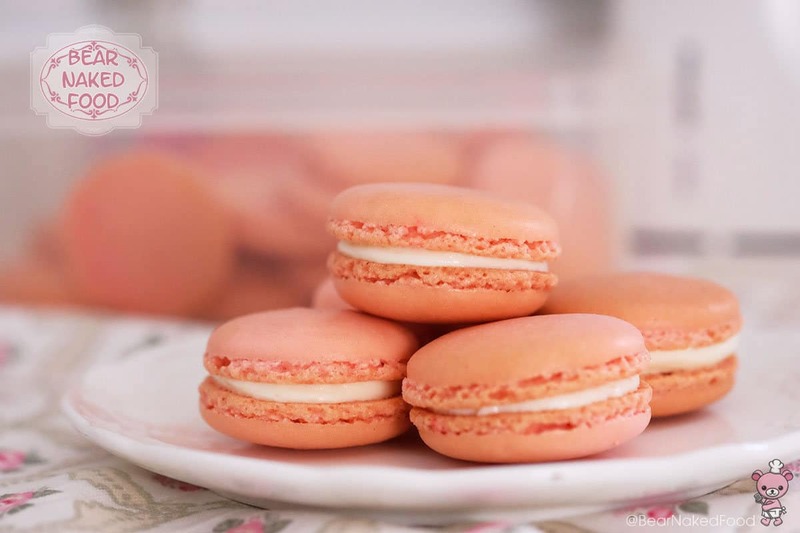 *Macarons always taste better the next day so you could make them a day in advance and store them in air-tight containers before serving. *If you are staying in humid environment, store them in the fridge. 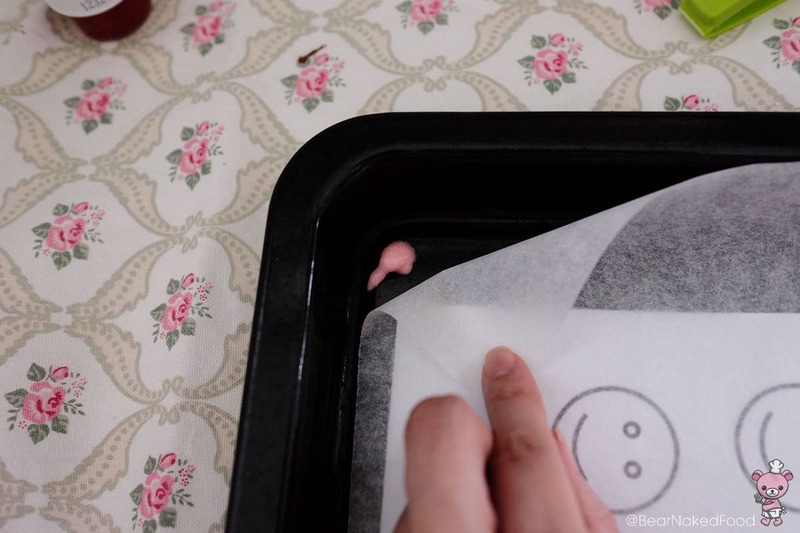 Pipe the meringue onto a baking tray lined with non-stick baking sheet. I placed a template in between the tray and baking sheet to guide me on the piping process. Remove the template once you are done. 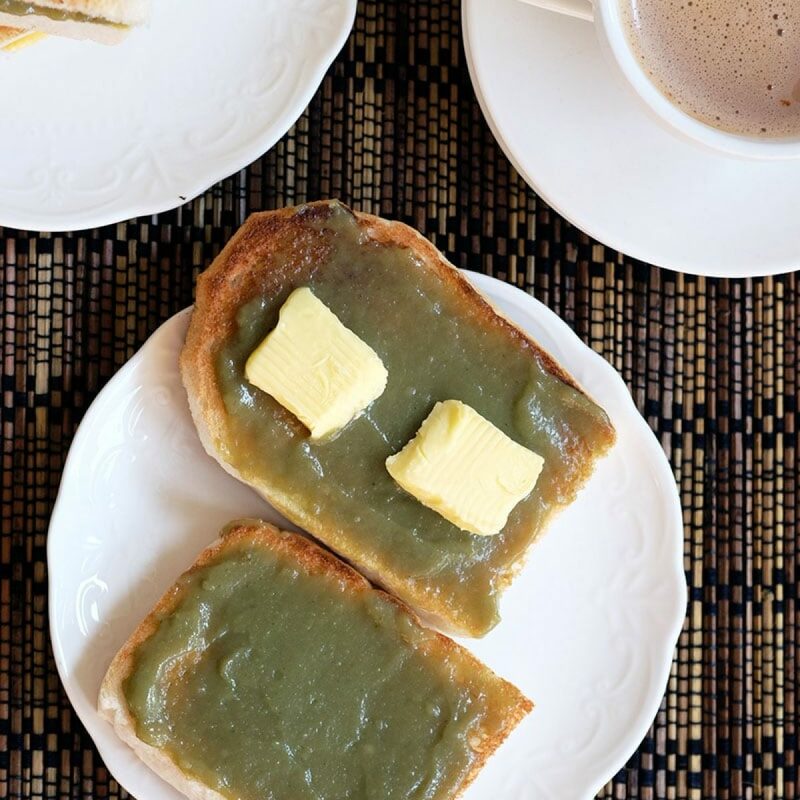 Set it to dry at room temperature for 45 – 60 mins or in an oven preheated at 40C for 15 mins. Bake in a pre-heated oven at 150C for 15 mins. 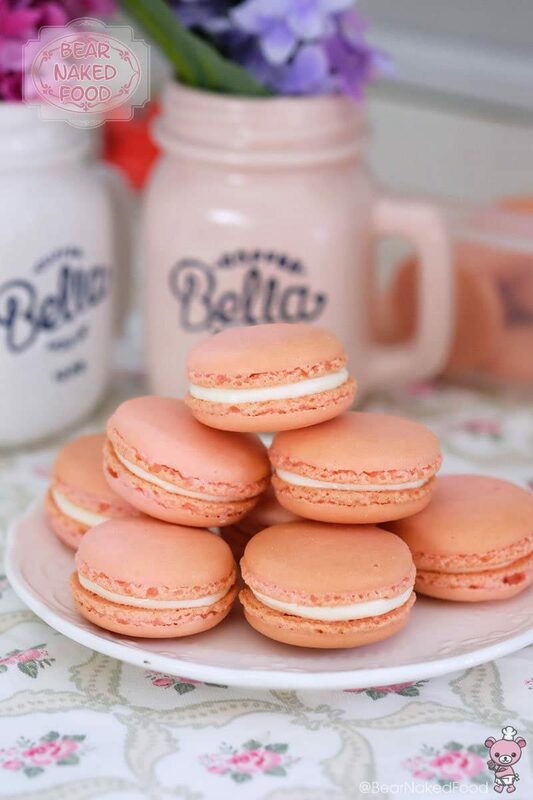 Macarons always taste better the next day so you could make them a day in advance and store them in air-tight containers before serving. 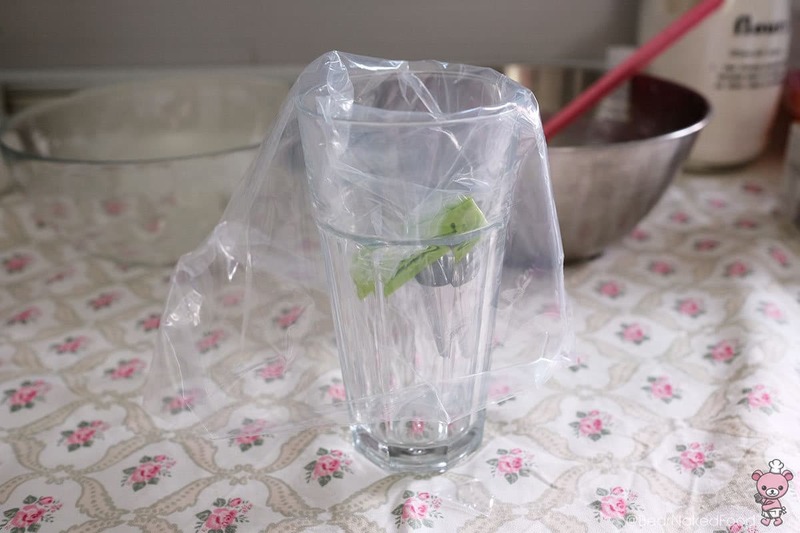 If you are staying in humid environment, store them in the fridge.